Exelare users can now use the power of Google to find candidates. Google search offers searching with several parameters like zip code, telephone area codes etc. Our team have made searching inside Google and adding to Exelare lot more easier. In Exelare, under "Candidates" click on "Source Candidates"--> Click the option "Web Sourcing". 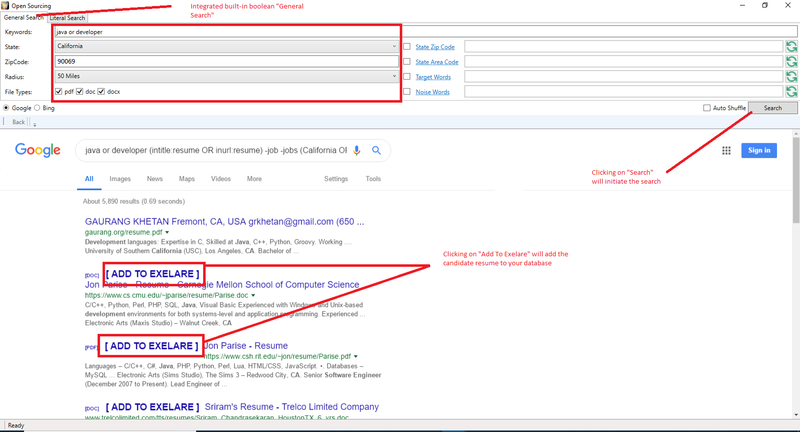 Boolean search on Google is one of the best option for recruiters. Boolean search allows users to combine keywords with operators such as AND, NOT and OR to produce more relevant results. Please review the below operators list and maximize your results. You could use an asterisk (*) to get more results for the term you’re looking for. account* will provide you with results both for accounting and accountant. You could use an asterisk (*) to get more results for the term you’re looking for. For example, account* will provide you with results both for accounting and accountant. If you’re searching specific job titles on LinkedIn, the asterisk could help you create a shorter string. For example, you could type ‘administr*’ instead of ‘administrative OR administrator OR administration’ and get the same results. Likewise, ‘recruit*’ is a simpler alternative of ‘recruiter OR recruiting OR recruitment.